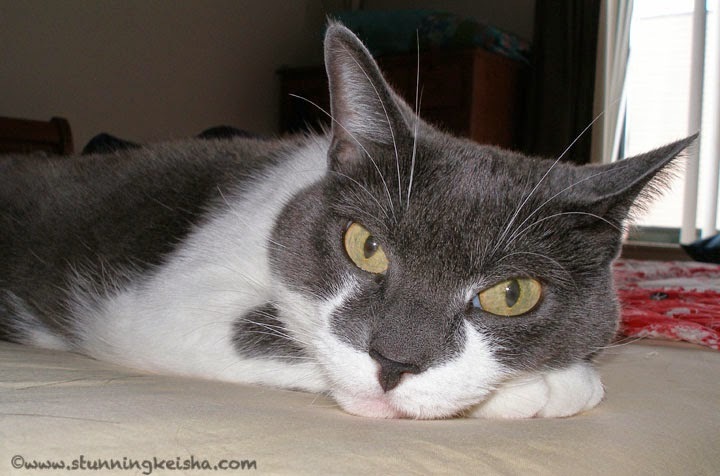 As an only cat who blogs, I am extremely fortunate. I’ve won many giveaways on other blogs and on Twitter. I’ve won food, treats, toys, beds, etc. and I appreciate everything I win. Sometimes I win so much, we have to donate it to the shelter cats. 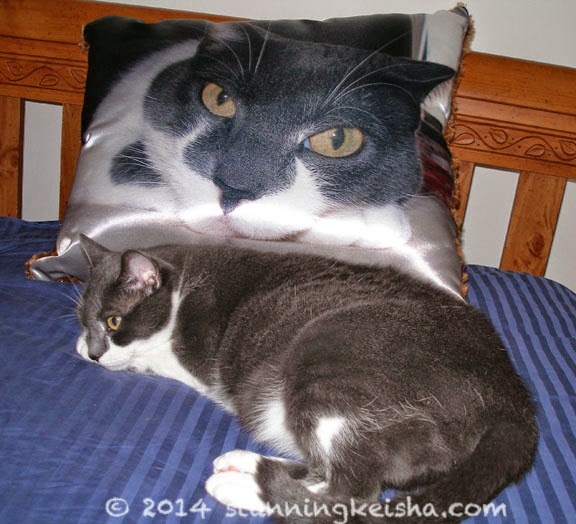 Back in June, I entered a giveaway on Cat Chat With Caren and Cody for a custom pillow from Custom Body Pillows. I’ve got to say this is by far the most amazing prize I’ve ever won. Let’s see: TW can either focus on the pillow or me and she chose the pillow. TW cried when she saw it and Pop was overwhelmed as well. The quality of the image was stunning just like me. I’m a cat so things that I can’t eat or play with don’t excite me; but the reactions of my peeps told me this was special. Let me tell you a bit about Custom Body Pillows. Their site makes it so easy to create your own pillows in two different sizes: full size (42 x 20) or half size (20 x 18). (I won the half size pillow, which is huge.) All you do a upload a high quality photo, choose your pillow size and backside material, and check out. You can crop or resize the image and see a preview. 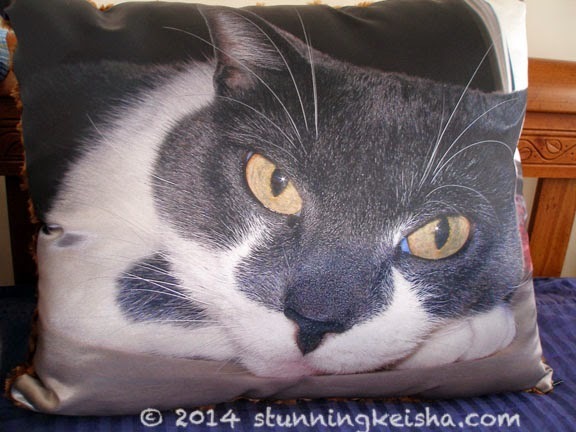 The 100% polyester pillows are hand-made in the U.S.A. and the covers are washable. and they did the rest. In case you’re wondering, the color on the pillow is true to the color of the image we sent them. The light and angle of the photos TW has taken of the pillow change the color slightly. She’s never been accused of being a photographer. There’s only one problem. As those of you who read my post on The Maaaa of Pricilla today may have already guessed, I don’t like seeing other cats on MY bed. I have been slightly more aggressive again since we received the pillow. I’m trying to get used to this “other” cat sitting here so comfortably. Getting between Pop and the interloping pillow. Many thanks to Caren and Cody; and Art from Custom Body Pillows. Disclaimer: I received the pillow as a prize, free of charge, but that did not influence this review. This little ghetto kitteh speaks her mind at all times. Well, on the one hand, it doesn't cuddle or purr or snuggle. On the other, it doesn't reject food, put the bitey on anyone, or demand that its litter box be cleaned twice a day. The Human is mulling it over. 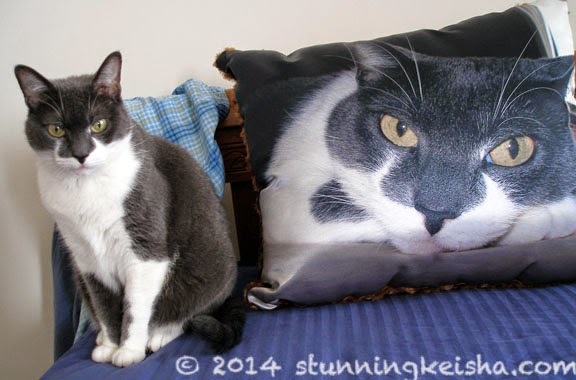 It are one gorgeous pillow, cuz it looks like you! I think that pillow is AMAZING, CK! I do understand how weirded out you are, though - I've been trying to get rid of the Mirror Kitty here for years and she won't go away! What a stunning pillow! We can understand your being a little startled by the pillow. Anything with eyes makes us do a double-take, even new stuffies. CK hope you get to like it in time as it is stunning just like your good self. Have a fabulous Friday. That pillow is just about the most amazing prize ever. I am so, so happy that you won...but wish that I had too MOL! Must be a bit weird to have the BIG CK face staring at you when you pop up on the bed....but it's just "double stunning" in that room now.....amazingly so! That really is one of the CK coolest things we have seen in a while! WOW! I love that pillow!!!!! They did a great job! I'm sorry you are feeling aggressive towards your beautiful pillow. Holy Ceiling Cat!! 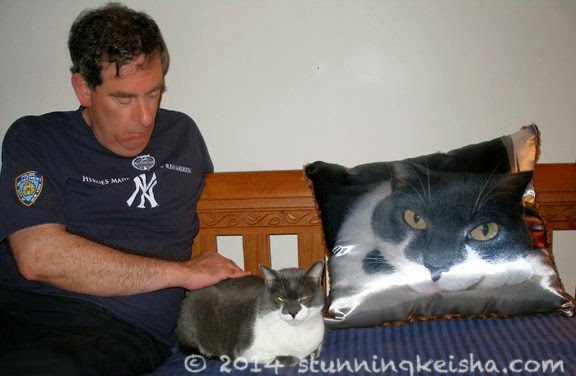 That is one pawsome pillow. Gotta go check that one out! Concats on the win! CK, THAT.....IS..... GORGEOUS! I LOVE It. Congratulations. What a lovely thing to win. Very cool! I am overwhelmed by the sight of TWO stunning CKs. CK your pillow came out AMAZING!!! OMG!!!! What an incredible keepsake to always have! I am sooo happy you won and your review was wonderful!!! Now...just realize that that pillow can't hurt you! It's just resting....it won't eat your food or play with your toys! Hoping you decide to cuddle with it one day! Oh Lucky CK we are going to bookmark the site! This is quite lovely! That pillow is fantastic! Maybe that pillow could go live on a chair somewhere and not in the bedroom so you wouldn't attack your Dad person?